CARLA ROYDER DESIGNS & CO is a full-service, award-winning and published interior design firm specializing in residential decor. Located in San Antonio, Texas. Carla Royder and her talented team of 11 women pride themselves on providing clients’ homes with personal, unique touches that other interior design firms can’t always offer. These perks include access to a wide network of boutique furniture dealers that provide one-of-a-kind decor. Most of the design firm’s business continues to come from word of mouth referrals. Clients are quick to share pictures of the firm’s work on social media, often complimenting the team’s attention to detail and unique designs. In a business so dependent on these type of referrals, having the time and resources to give such personalized attention makes all the difference. CARLA ROYDER DESIGNS & CO travels to High Point Market twice a year. The event is the largest home furnishings industry trade show in the world exclusively attended by interior designers and others in the retail furniture industry. Carla and her team will shop for VIP clients during these visits and stock up on unique and valuable inventory to use for upcoming projects. “It’s a great opportunity to meet new vendors, see what’s on trend, touch and feel pieces in person and also strengthen relationships with our favorite furniture vendors,” said Carla. Following these market visits, large orders of inventory will arrive to Carla’s studio and an off-site storage facility. With so much inventory coming and going, an intuitive organization system is a must. That’s why interior design assistant and superwoman Christine Bowie was underwhelmed and overworked by an ineffective inventory system when she arrived at the boutique firm in 2017. Designers were rarely in front of desktop computers where the inventory could be accessed. So designers, often out shopping or meeting with clients, would unnecessarily buy products, or forget about great pieces that had already been purchased and were located in storage. 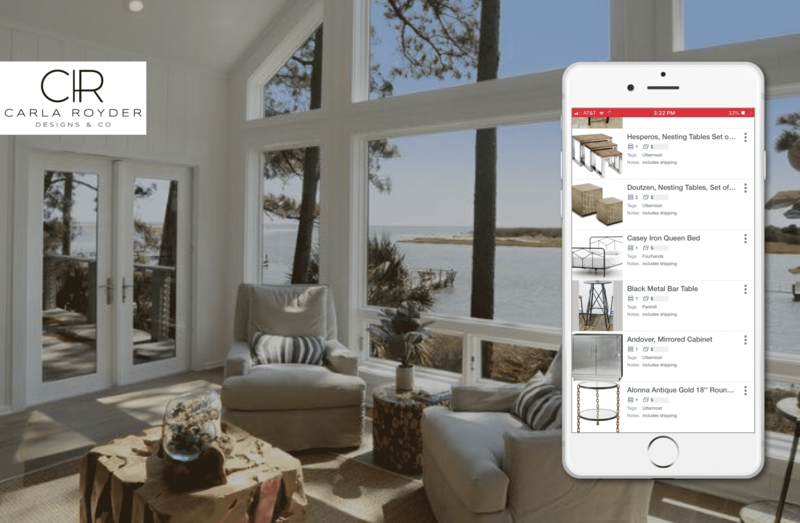 The firm’s marketing and operations manager, Nina Shokrian, heard good things about Sortly in an online interior design forum and decided to give the product a try. Instantly, Carla and her design team were sold on Sortly. “The Sortly platform is so user friendly. We were all really impressed with how quickly we were able to train the staff to use the system and easily integrate the program into the rest of our design business,” said Nina. And it doesn’t hurt that the app’s just, well, pretty. Before switching to Sortly, Christine said she was spending a couple hours a day managing the firm’s inventory manually. Designers would call or email her to find out what they had and where it was. All that changed with the app. Sortly Pro is a super-simple inventory system and asset tracking system that lets you visually manage all of your company’s stuff. 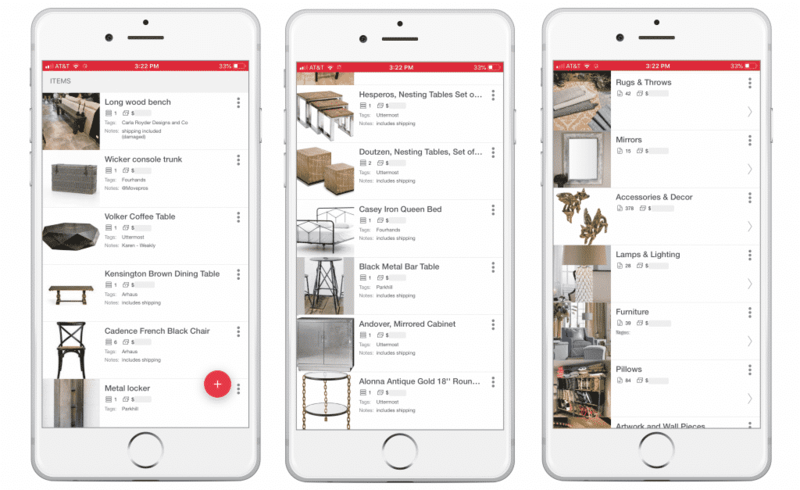 Our intuitive (and less maddening) app enables your team to track just about everything from anywhere and gives your business instant access to inventory details like item location, stock level, price and condition and any other details. Sortly Pro is intuitive; we built it to be up-and-running in minutes–so you can spend less time inventorying and more time businessing. Check out this short video of Sortly Pro inventory app’s most useful features. CARLA ROYDER DESIGNS & CO is a full-service, award-winning and published interior design firm specializing in residential decor. Carla Royder and her talented team design spaces that say who you are, where you have been and where you are going. The firm’s aesthetic pushes the envelope to create a space uniquely yours and prides itself on using a client’s forgotten items and turning them into treasures in a new space that truly reveals their unique style.